Windows 10 is now available worldwide, it is amazing, fantastic, glorious, is faster, smoother and more user-friendly. Many new features and compatible software/apps to dig into, but here first things is: does all you video files like the hot MP4 perfectly work on the new Windows OS? 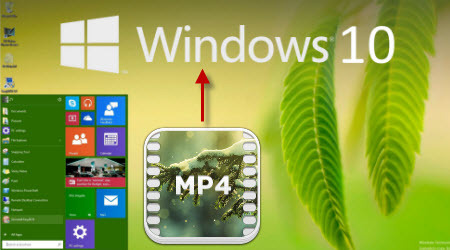 So this tutorial is to bring everyone up to speed on where to get the best Windows 10 MP4 Converter/Encoder and how to locate your downloaded/captured MP4 videos in Windows 10. Actually many MP4 Converters have stopped working with the newest Windows 10. If this happens, a reliable MP4 converter for Windows 10 is what you need which should have all the work done for you: Adjust MP4 for better preserving on iPhone, iPad, Apple TV, Android, Samsung/Sony/LG/Panasonic TV. Or have the need for turning MP4 into accepted video codecs or parameters, such as resolution, bit rate and frame rate to fit your media players. 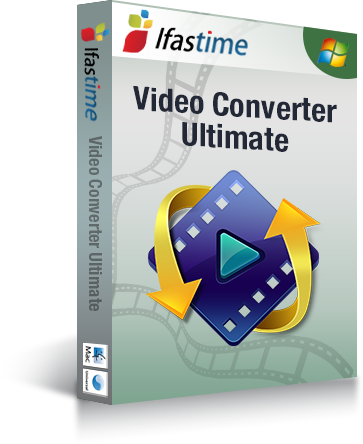 Here, one of the most trusted video converters by a lot of Windows 10 users is- iFastime Video Converter Ultimate. Constantly updated to fit with the latest technology, this amazing software is fully compatible with Windows's latest Windows 10 and can batch encode MP4 files into other media file formats like MKV, MOV, H.265 MP4, M3U8, MP3, FLAC, OGG, WMA, etc. effectively. It has a user-friendly interface and performs excellent. Plus, this smart MP4 Converter offers optimized preset for all popular devices, players or game consoles like iPad, iPhone, Apple TV, QuickTime, PS3, PSP, Xbox 360, etc. so you don't need to worry about the video settings. Install and open the Windows 10 MP4 Encoder on your Window 10. Click the "Add video" button to import MP4 video files into the application. It supports batch importing so that you can add as many video files as you wish. Click on "Format" bar to select output format. Here you can choose H.264 MP4, MPEG-4 MP4, MPEG-2, FLV, MKV, WMV, MP3, FLAC, OGG, WMA, etc from "Common Video" or "HD Video" as target format on Window 10. iPad, Apple TV, PS3, PS4, Galaxy Tab, Kindle Fire HD(X), Nook HD, etc preset profiles are provides as well. Click the "Start conversion" button at the bottom right corner to start encoding MP4 on Windows 10 compatible format. After conversion click "Open" to find converted movie on Windows 10. Enjoy! Have an abundance of MP4 files and also want to encode MP4 videos to Mac OS X El Capitan? 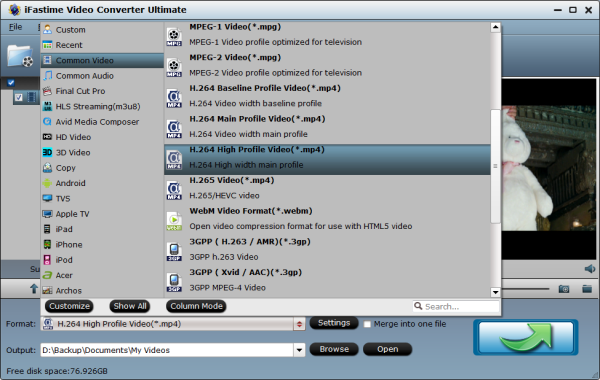 Please go to get iFastime Video Converter Ultimate for Mac which is capable of encoding MP4 to any SD/HD videos, e.g. MP4 to AVI, MP4 to MOV, MP4 to MPEG-2, MP4 to MKV, etc. and transcoding MP4 videos to almost all portable devices, including latest released smartphones/tablets, such as iPhone 6S/6S Plus, iPhone SE, iPad Air 2/Mini 4, Galaxy S7 and so on via Mac. And the mac workflow is almost the same. How to watch MP4 videos on Android Phones or Tablets? Originally I had some bad experience with other MP4 converters. BUT this converter works well for me and it’s worth the money I’ve paid.